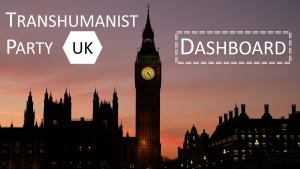 The TPUK Dashboard provides a status report of the projects being undertaken by the Transhumanist Party (UK) (referred to as simply "the Party" on this page). The Dashboard draws information from the Trello boards which officers of the Party use to keep track of specific tasks. The Dashboard is current as of 9th April 2019. The Party has relaunched its website transhumanistparty.org.uk using Webflow. The website provides a "Join us" link that connects to a database backend provided by NationBuilder. It also provides buttons to make a financial donation, and to commence a regular annual membership subscription. Next steps with the website include some additional information pages. The Party uses Mailchimp to create a newsletter and other email communications, currently at a rate of about one per fortnight. In addition to regular news updates, this mechanism can be used to issue press-release style comments by the Party. Copies of newsletters are also available on the Party website. The Party has asked for assistance from supporters to review and potentially update elements of the Party brand, including logos, images, colour schemes, and taglines. Some revised brand elements are now being rolled out. The Party also wishes to develop a team that can create memes containing messages supporting the Party. Incoming press and media inquiries are received by a team that decides the best response. From the formation of the Party, members have been invited to take part in a Google Group discussion forum. From April 2019, members and active supporters are invited to join a Discourse application, discourse.transhumanistparty.org.uk/. The Google Group forum will shortly be discontinued. Supporters of the Party are also able to share ideas on a public Facebook Group. Processes for managing these channels are currently adhoc. There is a large potential upside from making better use of these channels. An experimental Facebook Live video session took place between 6pm-7pm UK time on Sunday 3rd March, on the Party's Facebook page. The 22nd of April saw the first of what is envisioned to become a regular series of "Transhumanist tea-time" video shows. A second episode was broadcast live on Sunday 7th April. A supporter of the Party is developing plans to feature Party members and projects in a regular podcast series. The next step is to build a team of around 3-4 people in total to support this project, ideally within travelling distance to Bournemouth and/or London. The Party plans to organise online meetings using tools such as YouTube Live, Google Meet, and/or Zoom. The Party intends to conduct regular surveys of opinions and ideas held by members and supporters. An initial survey was launched in January 2019. The feedback from the first forty respondents has been collected and made available for public review. A vital part of human flourishing is our mental health. Many factors contribute to mental well-being, including genetic and environmental factors. Some writers suggest that psychedelics, used wisely, have the potential to significantly boost mental health. This applies both as a “cure” (helping people recover “normal” levels of psychological well-being) and as an “enhancement” (enabling people to reach levels of consciousness more profound than the ones normally encountered). However, the current legal framework puts many obstacles in the way of experimentation with psychedelics. The renowned science and food writer Michael Pollan has recently called for a re-evaluation of legislation covering psychedelics, in his latest book “How to Change Your Mind: What the New Science of Psychedelics Teaches Us About Consciousness, Dying, Addiction, Depression, and Transcendence”. Within the UK, key research into both the opportunities and risks of liberalising psychedelics has been carried out by Dr Robin Carhart-Harris of Imperial College and Professor David Nutt, also of Imperial. What policies should the Party adopt in this area? That’s the mission for this team to work out. Data and ideas to help craft this campaign are currently being assembled on the Party's Discourse. The Party wishes to "be the change we want to see in the world". This includes making wise use of technology to improve democratic discussions. For this reason, the Party is seeking to understand what processes it should follow, in reaching decisions on policies and campaigns. A draft flowchart of the policy, along with explanatory text, was included in the Party's newsletter distributed on 26th Feb 2019. In parallel with developing new policies and campaigns, there is a need to review the policies created by the Party in 2015, to assess whether any updates or revisions are needed. This discussion is taking place on the Party's Discourse. It has been suggested that members and supporters of the Party could receive some kind of quantitative "karma" reputation on account of active participation in Party activities. This could use the ideas of gamification to incentivise participation. The details need to be worked out. From time to time, the Party receives approaches from people interested in standing for election at local levels under the banner of the Transhumanist Party. The Party needs to agree a process for responding to these inquiries. The Party's NEC (National Executive Committee) has regular video meetings (currently once per fortnight) and also keeps in regular contact on a private Slack channel. To take good advantage of the experience and insights gained by transhumanist parties around the world, a set of "ambassadors" should be put in place. The Treasurer of the Party is legally required to submit a set of financial records each year, to the UK's Electoral Commission. The report for any year needs to be submitted before the end of March in the following year. Some Discourse categories and topics are restricted to those supporters of the Party who make regular financial contributions (such as the £25 annual membership payment). A document is being drawn up to give reasons why people with disposable wealth should consider providing extra financial support for the Party. Options for supporting the Party via sites like Patreon are being investigated. Since 2015 the Party has made use of NationBuilder to maintain a database of people expressing various kinds of interest in the Party. The utility of NationBuilder has been questioned. The Party needs to take a decision whether to move away from NationBuilder, or instead to improve how it is being used. The Party's constitution was created in 2015 and is overdue review. Ideally the constitution will be lean rather than heavyweight. A draft set of KPIs for the Party has been created. At present, however, for many of these KPIs, there is no way to measure them quantitatively.